Despite the initial neutrality of Greece in World War I, in October 1915 the Anglo-French army of Entente lands in Thessaloniki and forms the “Allied Army of the Orient”. Soon, Greece is officially divided into the Government of Athens under H. M. King Constantine and into the Provisional Government under the leadership of Eleftherios Venizelos, a fervent advocate of the Allies. On 18th November 2016, the allied troops land at Piraeus, march to Athens and camp, among other places, on the Hill of the Muses (Philopappos). The “National Schism” culminates in 1916, after a conflict that became known as “Noemvriana” (November events). In 1917, the lens of the Photographic Services of the Allied Army of the Orient captured Athens at that time, bequeathing to future historians a significant heritage. The Sphere newspaper, London 16 Dec. 1916; Mourelos 2007. 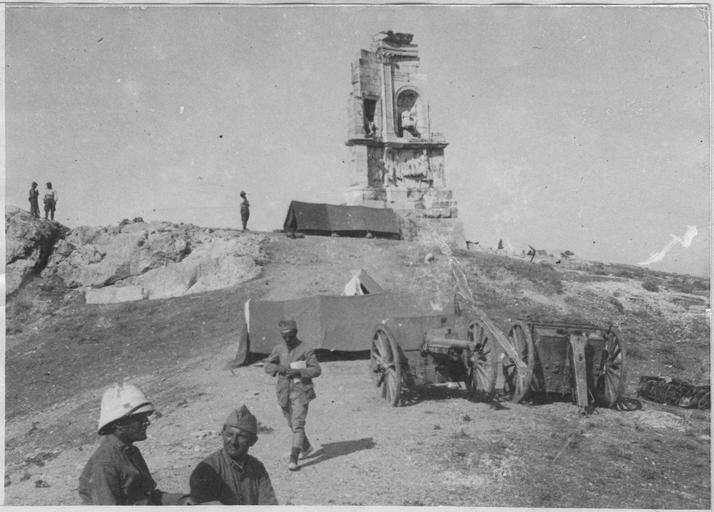 The monument of Philopappos witnesses the daily routine of the “Allied Army of the Orient” (1917).